Back in 2001 there was a game called Operation Flashpoint: Cold War Crisis on the PC. It was developed by a small European company named Bohemia Interactive, and the game was groundbreaking for its day. It was a giant open world warfare simulator that let players drive tanks, fly helicopters, and control troops. It's always stuck in my head as an amazing gaming experience. I tell you this because Bohemia has created a brand new title in a similar vein called ArmA 2. Like Operation Flashpoint and ArmA before it, it's a giant open world military simulation giving the player a ton of freedom. With a single player campaign playable in co-op, numerous bonus features like an armory of all the game's objects, a mission editor, an incredibly deep online mode, and literally hundreds of vehicles and weapons - there's very little here to get bored of. 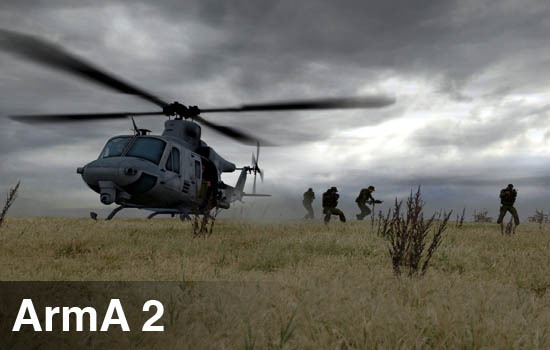 ArmA 2 thankfully supplies you with a series of training excercises to get you familiar with the game and game world. After that it's off to do whatever it is you want to do. There's several quick missions you can hop right into, or you can pick up the game's story. The Red Harvest story puts you in control of a squad of operatives placed into a country at war. The game's map is approximately 225km, and every inch of that is at your disposal. You'll find missions that take you from one end to the other, with various forms of transportation at your disposal to quicken the journey. Your squad constantly communicates enemy positions and points of interest to each other, almost too frequently, adding to the immersion of the game. Unfortunately the voice acting is some of the worst I've heard in a long time for a game, so don't expect any Morgan Freeman style voice overs. 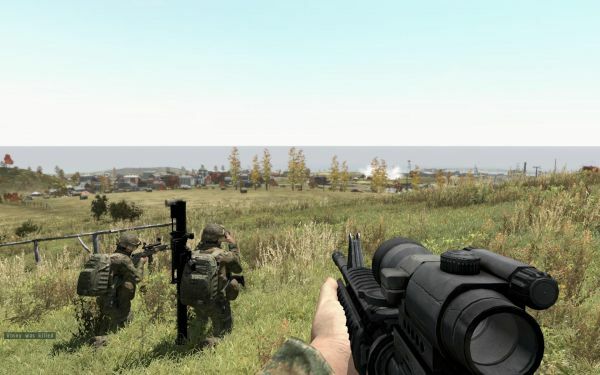 Everybody loves a pretty game, and ArmA 2 is by far one of the most realistic looking games to date on any system, huge, expansive, lifelike environments lay in front of you. It's the little touches, like grass the gets flattened as you crawl over it, that add to the experience. Of course all that pretty takes a toll on your PC, so be prepared to do some tweaking - or invest in an upgrade. The audio effects work well enough, though the odd guitar riffs and music that randomly seem to pop up during the campaign feel a bit out of place. ArmA 2 is a military sim, and should be treated as such. Running and gunning does you no good, and it only takes one stray bullet to knock you off your feet. Teamwork and communication are crucial. And while you can heal characters to a certain degree, being shot causes sustained injury, so expect to be gimping around for the rest of the mission if healed. The biggest problem I have is there is only one save slot in the game, and it only auto saves at mission way-points. You could travel for 20 minutes and not hit your next objective, only to be killed by a sniper hidden in the grass 500m away. It's definitely a lesson in frustration, especially when you randomly encounter one of the game's bugs or glitches. Page created in 0.2622 seconds.